Whether you’re using Adobe Scout or good old getTimer, there is a fundamental limitation: all times are in whole milliseconds. This is an issue if you’re trying to measure code that executes very quickly or compare code that has only minor differences. In these cases you get inconsistent results (7ms, 8ms, 7ms, 7ms, 8ms, …) when you’d much rather have better accuracy (7.3ms) with sub-millisecond precision. 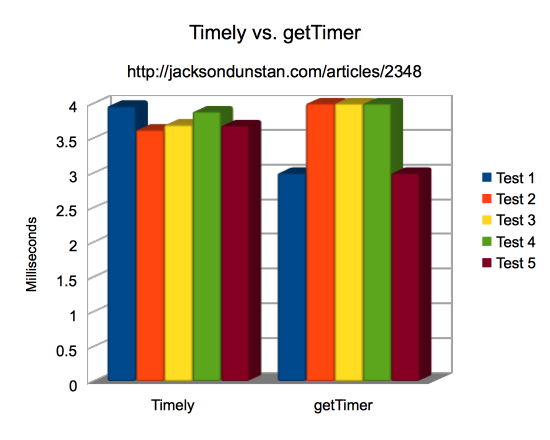 Today’s article introduces a new helper class called Timely that makes sub-millisecond precision a snap. Read on for the source code and an example app. First things first, today’s article is heavily inspired by a technique described recently by Benjamin Guihaire. There are, however, some differences in our two approaches to sub-millisecond timing, but comparison is not the focus of this article. If you’re interested, check out his article on the topic and the rest of his site while you’re at it. It’s a great read. Feel free to re-use the Timely object as many times as you’d like. You’ll most likely only need to create one of them. And that’s all for the Timely API. It’s designed to be simple to use, add minimal bloat to your SWF, have zero dependencies, and even be extendable in case you’d like to subclass it to add or change any functionality. Of course, as with all code I post on this site, it’s also open source under the extremely permissive MIT license. As for how it works, there are three main concepts. The first is that when you call getTimer you have no idea where in the millisecond you are. You could be 0.1 milliseconds into it or 0.99. Since you only get a whole int number, you just don’t know. So the first step is to construct a very tight loop that simply checks getTimer over and over until its return value changes. At that point at least we know that we’re close to the beginning of the millisecond. We’re probably not exactly at the beginning, but perhaps a few nanoseconds after it. This is, therefore, an approximation system but one that is far more accurate than simply using whole milliseconds. Second, in the calibration step we perform more of these tight loops checking how many of them we can do in one millisecond. For accuracy, it’s good to use many milliseconds and take an average rather than just one millisecond. Third, when we stop the timer we again don’t know where we are in the millisecond. However, we can perform the same sort of loop again to check the time until it changes. We can compare the number of iterations of this loop to the number of iterations we could do in one millisecond that we obtained during calibration and use this to approximate the portion of the millisecond that was not used when the timer was stopped. For ultimate detail, please read the following source code of Timely. It is almost entirely made up of comments and there is very little actual code within it. This is to make it as readable as possible for the purposes of this article, among other. To really understand how this works, have a read and keep in mind that “comments are free”! * whole-millisecond values provided by raw usage of flash.utils.getTimer. *                  before using it or set iterationsPerMS manually. *                      slow compared to most operations. // achieve in each subsequent millisecond. // call to this function. Finally, the sample app. This app simply compares the results using the traditional getTimer approach and the new Timely approach. Your computer’s calibration results are displayed at the top followed by CSV-formatted results and bar chart versions of both. Notice how the getTimer results are always waffling between 3 and 4 whole milliseconds while the Timely results only range between 3.619 and 3.962: a huge improvement. However, there is one downside to using Timely. In addition to several milliseconds of calibrating, it also requires up to a whole millisecond to start the timer and up to a whole millisecond to stop the timer. This overhead is extreme compared to the negligible time that simple getTimer calls take, so use Timely only in performance test apps or sparingly in production code. I’m considering switching all future tests on this site to using Timely. What do you think? Let me know in the comments and especially if you find any bugs in Timely or have any suggestions to improve the accuracy of timing AS3 code. I can not imagine the time you would spare if you had this library before! You have no idea! After ~250 performance testing articles on this site I am constantly seeing endless streams of whole integer milliseconds. I see “4, 4, 4, 3, 4, 4, 3, 4, 4, …” and just decide to report a 4. Now I can know that the actual time is about 3.8 and I don’t need to run the test 20 times to get a good “feel” for which whole integer is more correct than the others. With Timely, two or three tests should suffice and save me a bundle of time. I think it would be a good idea to run at least the next few future tests using both Timely and getTimer. This way, you could give Timely a good test vs. getTimer, and confirm that results Timely returns are meaningful. I think that’s a prudent move before switching completely to Timely.